I love gift cards. Oh, it’s not the “getting” of gift cards that I love. For shallow people the obligation that goes along with the receiving of gifts warrants a post all to its own. No, what I love is that gift cards exist for the giving. Let’s face it, the fact that I have mastered the art of feigning interest probably means that I don’t know as much about those around me as one might hope. Honestly, do people really expect me to discern their favourite colour by simply looking at what they wear everyday? Or is it through some kind of osmosis that I am supposed to know whether it’s the “cinnamon appleberry” or “apple sunset” Yankee Candle scent they prefer? Perhaps there is a way to determine if someone likes light better than dark chocolate, but I sure don’t know how that’s done. And when it comes to choosing between red or white, well after the first glass it’s all the same anyway, isn’t it?. And so it is that the practice of appropriate gift giving has alluded me. But don’t get me wrong. It’s not that I don’t want to give gifts, it’s just that finding “things other people might like” can be so overwhelming at times. I mean, how often do people really like the gifts that they get? Sure, they smile politely and thank you profusely for your thoughtfulness all the while trying to make themselves believe that it truly is the “thought that counts” and that maybe someone, somewhere would appreciate having “whatever this is” on their mantelpiece. As a matter of fact, this is such a commonplace occurrence that we now talk about “regifting” as if it were part of our everyday routine…like eating breakfast, or going to work, or drying cranberries. Well that last one might not be in everyone’s routine but it’s in mine as a result of a fruit dehydrator someone gave me for my last birthday. Of course there is always the “cash” option, which, while ultimately may be the recipient’s preferred choice, seems a tad crass even if you do remember to pick up one of those newly minted hundreds while making your weekly bank deposit. Because the thing about cash is, not only does it let someone know that you don’t have any idea about what to get them, it also means you don’t really care about what they get themselves. For all you know they are using the money to feed some sort of nasty addiction they have successfully hidden from you and honestly, how does that make you feel? Trust me, the advent of gift cards is truly a godsend not only for those of us in the shallow sphere but also for those who are not yet there. Think about it. You can gets cards for almost everything these days and it’s not that hard to figure out where someone shops or eats. You can give someone a gift and not have them know how cheap you are until they get to the store and by that time they will have forgotten who gave them the card. But most importantly, and I’m pretty sure this was the impetus behind the invention in the first place, you can buy someone a coffee, or even dinner, without actually having to be there to enjoy it with them. So who ever said I was nice? Never thought of it that way. Of course I have never thought of it that way! Love this post and agree with it completely. One of life’s real pleasures, for me anyway, is stumbling across something that you know somebody will love, really love, the perfect gift. However, it never seems to happen when you need a gift for somebody. It only happens either right after you have gotten them a “stand by” gift or some other inconvenient time that will make you not only have to remember that you bought it, but also have to remember what you did with it when the time comes. I have always liked just giving people things for the heck of it because it was perfect for them. Why can’t we just do that, and then have credit for when the occasion does roll around? Gift cards, credit, they are all the same, aren’t they? 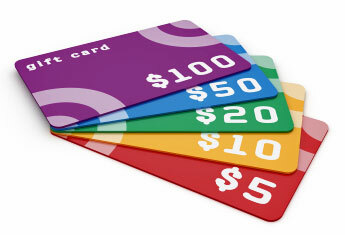 Why not just give the “universal gift card” = cash? Then they can spend it whenever and wherever they want. Seems to me that gift cards benefit the stores more than the recipients. Love comments…love new readers. Thanks for stopping by.